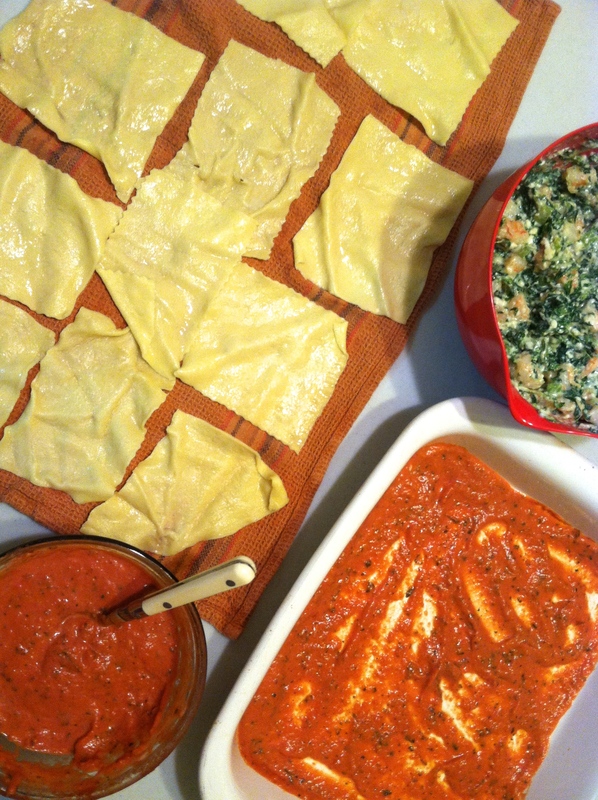 Here’s the recipe for the Shrimp Cannelloni. It’s a bit more involved than I usually get, but it’s worth the journey. Make it on a day when you can relax and have fun with it (or involve friends, family, or kids!). Let me know if you have any questions about the recipe or process. Drain and the canned tomatoes, reserving the liquid. Drizzle olive oil on a baking sheet. Add plum tomatoes from can, onion, garlic, parsley, and season with salt and pepper. Spread mixture out. Bake in a hot oven until simmering and caramelized—about 20-30 minutes. Transfer to the bowl of a food processor and pulse sauce until blended. Stir in the reserved tomato liquid. Stir in the cream. Adjust for seasoning. Whisk the flour and salt in a large bowl. Create a “well” in the middle of the flour and add the eggs. Using a fork slowly mix the flour into the egg, until the dough comes together. Press dough together to make a rough ball. Gather the dough and knead on a lightly floured surface. If it’s too sticky add a little flour. Knead for about 5 minutes until smooth. Shape into a ball and cover with plastic wrap. Let rest at room temp for 30 minutes. Cut the dough into four pieces. Work with one piece at a time and keep the other pieces covered in plastic wrap. Flatten the dough into a rough rectangle, and roll through the pasta machine, changing the numbers from thick to thinner one at a time until you reach the setting before the last. Lay the sheet on a table and cut it into rough squares approximately 4 inches wide. Repeat with the rest of the dough. Heat water in a pasta pot until boiling. Add salt. Boil pasta sheets until al dente then remove and rinse under cool water. Melt the butter in a heavy-bottomed saucepan. Add the flour and whisk until flour is cooked, about 2 minutes. Add the milk and whisk. Season with salt, pepper and nutmeg. Simmer over medium heat, whisking, until thickened. Allow to cool. Heat the oil and butter in a large skillet. When hot, toss in the shrimp. Season with salt. Cook a minute or two until hot, then add the brandy and let evaporate. Take shrimp out with slotted spoon and reserve. Add the onion and celery. Cook until softened. Take mixture off the heat to cool. In a medium mixing bowl, stir together the the onion and celery, spinach, shrimp, mozzarella, besciamella sauce, parsley, . Season with salt & pepper. Lay some paper towels on a work surface and lay out the pasta sheets on top. Add 2-3 tablespoons of the shrimp filling on one of the short edges of a pasta sheet. 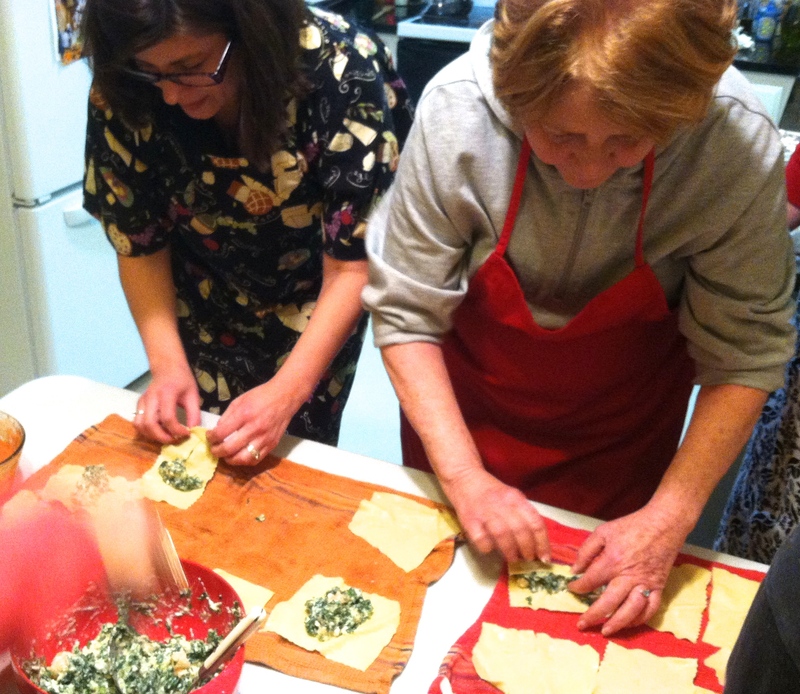 Roll up to form the cannelloni. Repeat with the rest of the pasta and filling. 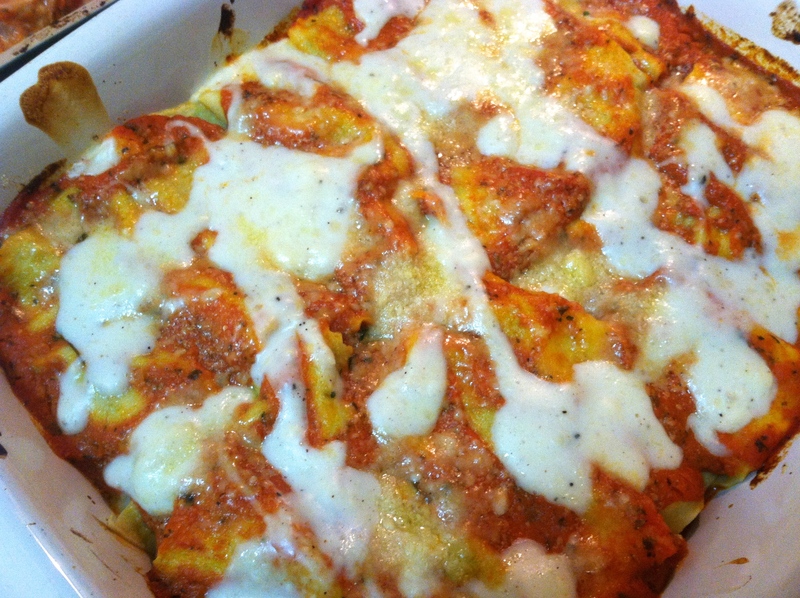 In a casserole dish spoon some of the tomato sauce, Line up the cannelloni in the dish seam side down. Spoon tomato sauce over the top. Sprinkle with grated cheese. Bake for 40 minutes until golden. Serve warm. NOTE: In picture below we had some extra besciamella sauce left so we drizzled it on top of the cannelloni before baking. 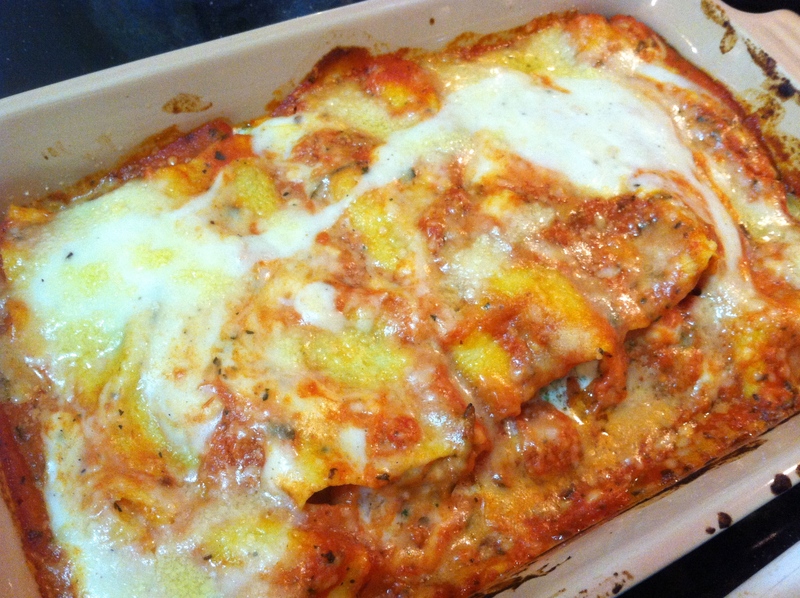 time to eat the cannelloni! Wednesday night’s class was a knockout! Here are some pix…this is a delicious dish. Let me know if you’d like the recipe! 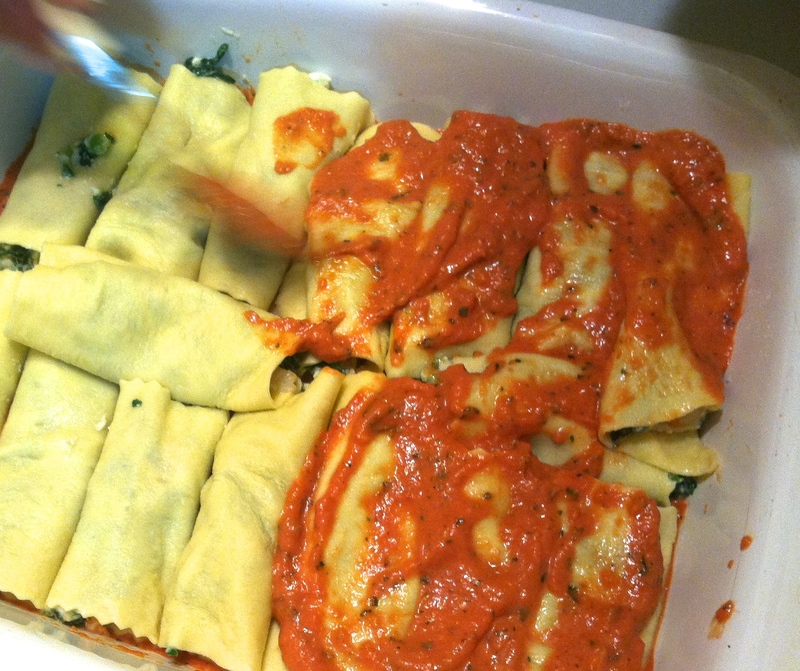 cannelloni almost ready to bake!